HTC’s Desire Eye has an amazing front camera, powerful specs, solid design, and supposedly isn’t as expensive as its competitors. 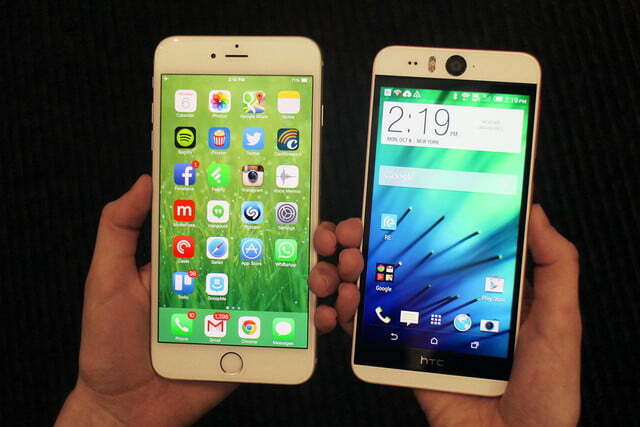 It could be the Android phone to beat this holiday. We like to mock people for taking pictures of themselves, but we’ve been doing it as long as cameras existed. The only thing that’s changed is that you finally don’t have to ask a stranger to take your photo to get everyone in the shot. Now, thanks to the HTC Desire Eye, you won’t need to awkwardly try to take a picture of yourself with your rear camera if you want a good photo. 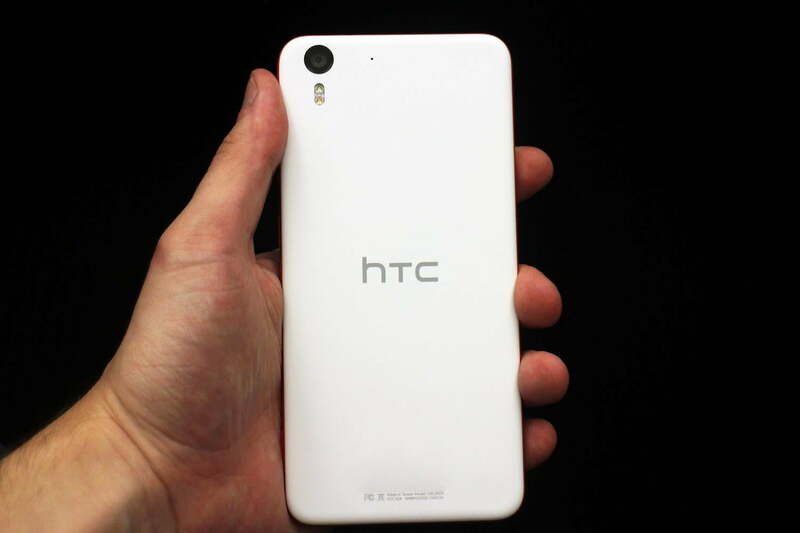 And did we mention it’s as fast as any phone on the market, and will supposedly it cost less than the $600+ HTC One M8? The only downside is that it’s an AT&T exclusive — for now. A lot of phones have upped the quality of their front-facing cameras. 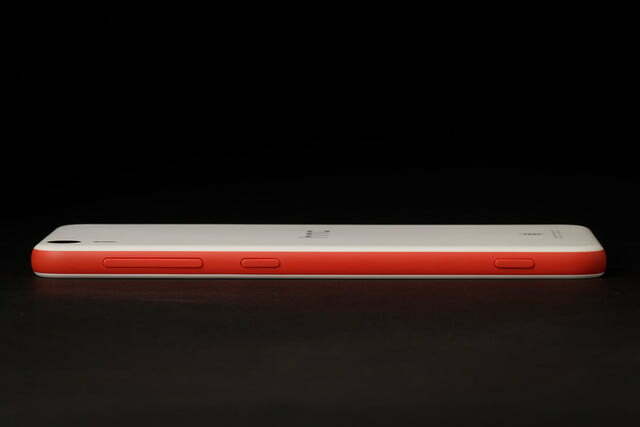 The Galaxy Note 4, for example, has a 3.7-megapixel snapper up front. Some Huawei phones (a big Chinese maker that’s trying to break into the U.S.) have 5-megapixel front cameras. 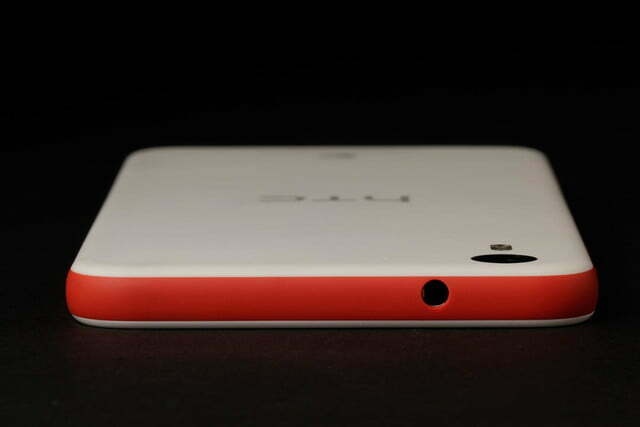 But the Desire “Eye” has the first 13-megapixel front-facing camera we’ve seen, complete with a dual-LED flash. This phone has the exact same high-end camera on the front and back, so no matter which way you’re shooting, it should look pretty damn good. We had a chance to try out the phone at a briefing, and the front camera impresses. You’ll no longer get noisy shots that look like they came out of the original Motorola Razr, or blurry video that’s only suitable for Skype. And the LED flash should clear up your Vegas night selfies. We’ll need to do more tests, but it appears to have most of the bells and whistles you’re used to on an HTC, and should sit in the same league as devices like the Galaxy S5 and iPhone 6. There are a few fun new camera modes. None will revolutionize anything, but they could enhance a good time. 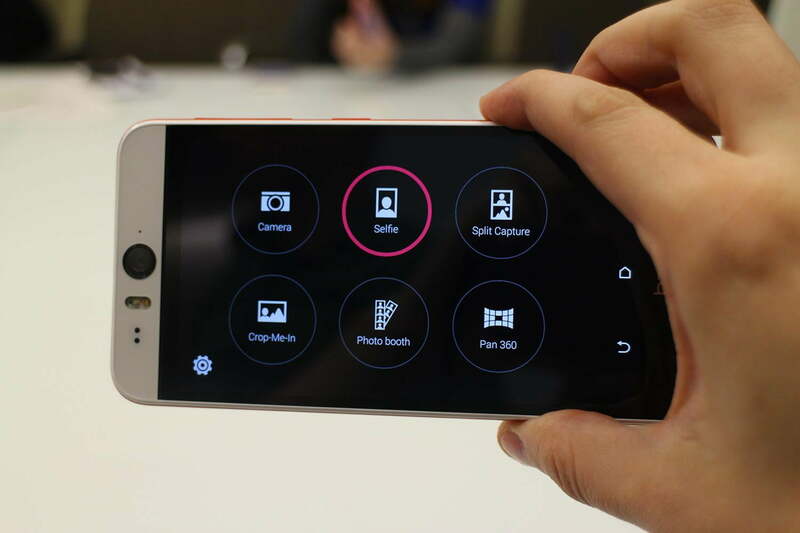 Split Capture: This lets you take a split-screen shot with the front and rear cameras. Take a shot of you, then a shot of your friend, or a beautiful vista … whatever you want. It’s simple and could be fun. Photo Booth: As you’d expect, this takes 4 shots on a timer, like a photo booth. Again, simple and fun. Crop-Me-In: This mode lets you use the front camera to crop yourself into another photo. The software cuts out the background around you (to mixed results) and you can shrink/move your picture into another shot. It’s a good way to pretend you’re the life of the party — every party. Dedicated camera button: Yep, this phone has one. A very fun blast from the past for Android phones. Selfie Auto shoot: If you stay still enough, the camera will automatically take your picture. This didn’t work well for us in testing, but we look forward to trying it out on the full unit. Zoe photo sharing: Zoe is an app that combines photos into sharable collages with motion and music. It comes with the Desire, but will also be available on Google Play and the App Store, so if you have an iPhone or non-HTC phone, you can use it, too. HTC is known for making the only Android phones you’d want to put on a mantle next to an iPhone, and though the Desire Eye is polycarbonate, it still looks and feels premium. The strip of red plastic on the sides has a seam so clean you can’t feel it, and the whole phone has a nice matte finish that won’t attract fingerprints. With a 5.2-inch screen and 8.5mm thickness, we had no problem gripping and using the phone. The right side houses the volume rocker and a power button under it, which is a very Nokia-like button design, but works. Thanks to the lower placement, you can more easily hit the power button and on-screen navigation buttons — Home, Back, Recent Apps — without shuffling the phone and changing your grip. Every time you have to change your grip, you risk dropping a phone. We’re glad to see HTC has listened to feedback. 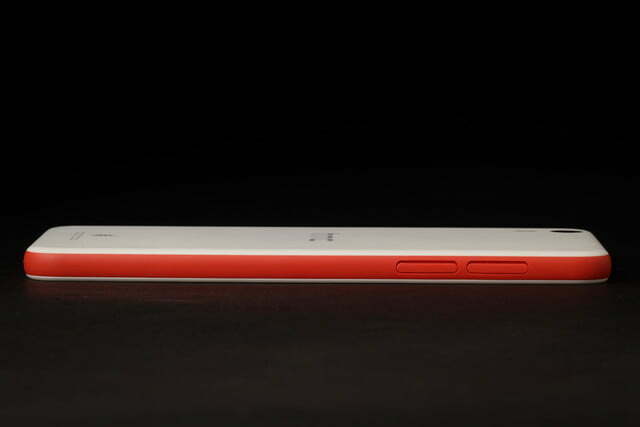 As recently as the One M8, it placed the power button way up top. 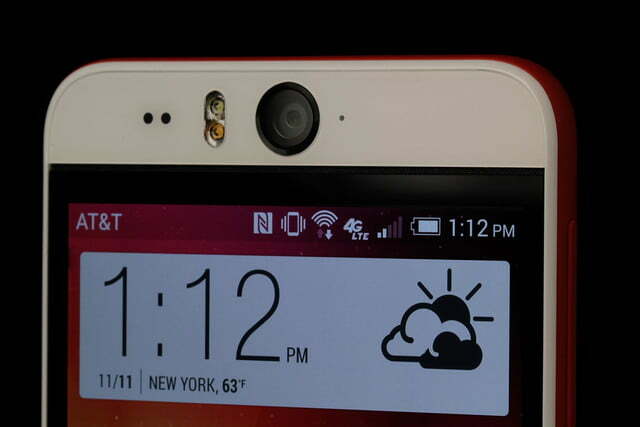 The Desire Eye can also be unlocked with a double tap on the home screen, or a swipe, like an LG. 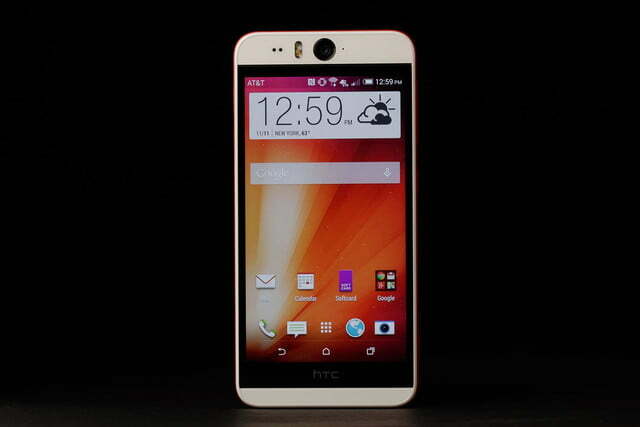 The Eye runs on Android 4.4 with HTC’s typical skin, which it calls HTC Sense, redecorating the menus. But what’s best is on the inside. This phone packs a 2.3GHz quad-core Qualcomm Snapdragon 801 processor, 2GB of RAM, 16GB of storage (MicroSD support up to 128GB cards available), a 2,400mAh battery, and a 1,920 x 1080 pixel LCD screen. Basically, that means its about as good as an HTC One M8, Galaxy S5, LG G3, Xperia Z3, Galaxy Note 4, or any other high-end Android phone out there now. A few devices have 1440p screens, but 1080p is an absolutely fantastic resolution. It wasn’t discussed much, but the Desire Eye also has IPX7 water resistance, so it can take a shower — just don’t intentionally take your phone underwater. Finally, HTC has included BoomSound speakers, which is its marketing word for dual, front-facing speakers. The One M8 has these and remains one of the best-sounding phones around. 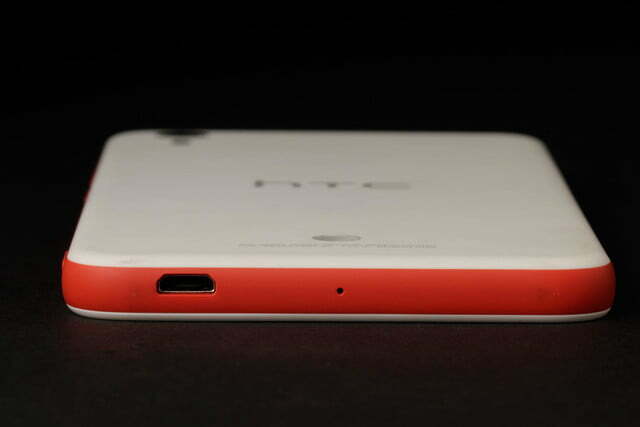 We’re happy to see HTC fit front stereo speakers onto the Desire Eye. If you’re on AT&T — and depending on the price HTC nails down, which we hope is well under $500 — the Desire Eye is a great phone to check out. We haven’t done a full review, but based on what we’ve seen, it has the best front camera on the market, high-end specs, solid construction, and HTC claims it will have a good price, too.